Jesse Knows How To Feel Filthy Rich Without A Lot Of Cash: Just Sit Behind The Wheel Of His Clean '62 Ragtop. Jesse Marron is from the Southern California Inland Empire area, the city of Rialto to be exact. It was around this region that he cruised down a local street and came across this ’62 Chevy Impala. In general, ’62s are a rare find, but especially a convertible. This perfect find was at the right price and Jesse just couldn’t let this one pass him by. This classic ride was in fairly good condition considering its age, and best of all, it had not been modified whatsoever; only last being touched by the Chevrolet factory way back in 1962. After Jesse successfully negotiated the sale for about $8,000, he drove home a very happy man. His intent was to keep this Impala in the original style as much as possible, yet still have that distinct lowrider look. He didn’t want to cut into the frame with a set of hydraulics, so he decided to go with a custom air ride suspension that just basically bolted on in place of the stock shocks. Other than the suspension, the rims and tires were the only other obvious change done to the ride, and even then, these rims are the old school Tru Ray chrome spoke wheels. With two and a half years and about $30,000 invested, the born again ’62, now known as “Color Of Money,” is complete and turning heads everywhere it makes an appearance. A visual look around this car will turn up tons of eye-appealing makeovers and Jesse’s obvious attention to detail. Just about all of the possible optional accessories available for this six-deuce are found, including the original hazard flashers, autotronic eye, trunk opener, flashlight holder, trash container, tissue dispenser and even a color bar to light up to the soothing sounds of the oldies blasting over the sound system. Jesse gives big thanks to his friends and family, including his wife, son Jesse, and the Trucha Car Club. He tells LRM that at this point he has no further plans for this ’62, but definitely has no intent to sell it. Look out for Color Of Money as well as three other low rides that Jesse owns at the next custom car show or get-together. 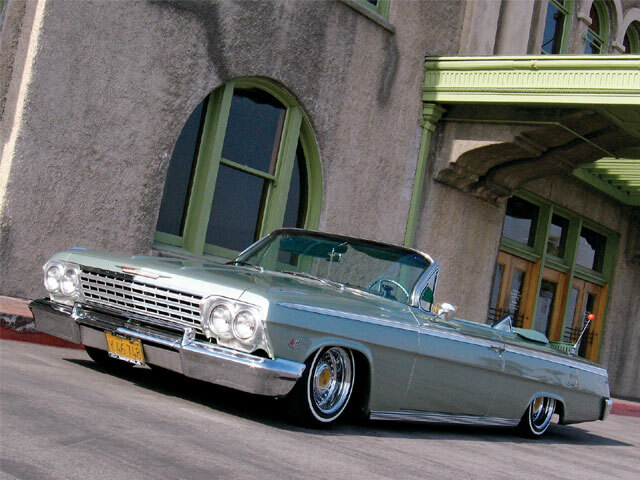 Color Of MoneyOwner: Jesse MarronVehicle: ’62 Chevrolet ImpalaCity/State: Rialto, CaliforniaClub: Trucha C.C. Engine/Drivetrain: Alex at P&G Auto and Transmission in Rialto was in charge of the ’62 small-block 283-c.i.d. engine rebuild with an automatic Powerglide transmission. Body/Paint: The famous Evan’s Auto Body in San Bernardino, California, was hired as the shop to do the Impala’s pre-paint body prep work. Jesse opted to go with DuPont light green as the ride’s ultimate coat. Interior: J&R Upholstery in Los Angeles, California, did up the interior in OG-style leather, color-matched to the exterior. Sound System: Jesse’s son (also named Jesse) did a clean install on the audio system. Top-of-the-line equipment was chosen for the entertainment, including a Pioneer CD player/head unit, 150-watt amplifier, Sony 6x9s and Audiobahn woofers. Suspension: Jesse decided to go with something different for custom suspension control. 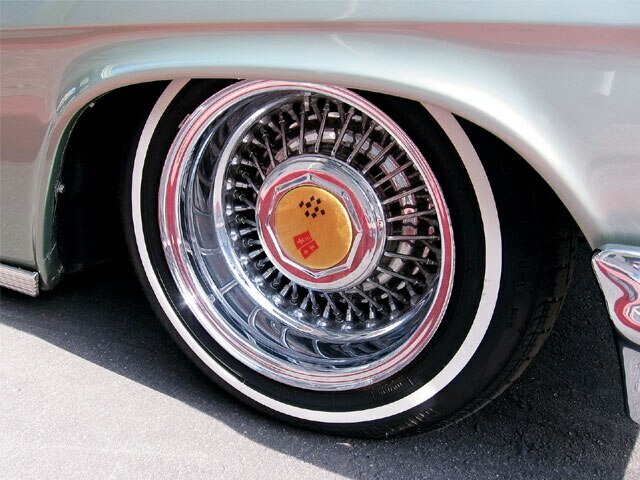 Rather than choosing the typical lowrider setup of hydraulics, Jesse opted to go with new age airbags. Joe at Ground Control in Chino, California, set up two air compressors, 11/48-gallon air tank and 2.5-inch hoses, all powered by the battery under the hood and controlled by four switches.